Grass needs four essential growth factors: sunlight, water, nutrients and air. The soil conditions influence all of these except sunlight. The plant takes up water, nutrients and oxygen from the soil. But down at the roots carbon dioxide is produced, accumulates and needs to escape to the atmosphere. ‘Traffic’ across the lawn, walking backwards and forwards, kids playing, pets wandering about all help to compact the soil, resulting in thatch and organic matter accumulating in the root zone. Noticed some squelchy patches on the lawn in winter? 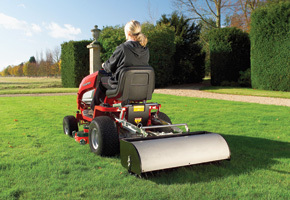 There’s not much to be done for the grass at this time of the year but what you can do is spiking and aerating to greatly improve drainage, using a hollow tine aerator to remove thin plugs of soil. 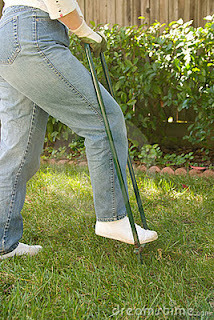 Or you can spike with a garden fork down about 15cm/6” deep. After spiking a few square metres, brush a dressing of sharp sand into the holes and spread a top dressing to help the grass root in the spring. Remember to use only sharp sand and never builder’s sand for this. The Gardener’s Journal will bring you tips throughout the year to help grow and maintain a healthy and attractive lawn.